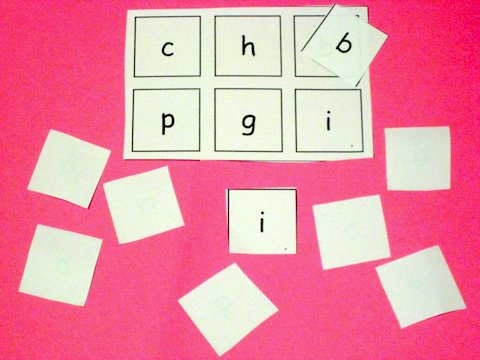 Here’s how to make your own bingo game to help your child practise their letters. 1. Make several grids on paper or card. You can draw them by hand or print them from the computer. You need at least one grid per player but if you make more you’ll be able to swap cards and play the game several times. You can make the grid any size you like but 6 squares are a good start for pre-schoolers. 2. Add a letter into each square. 3. Make a set of square cards with a letter on each, corresponding to the letters on your grids. 4. Give every player a grid and then turn the square cards face down. 5.Take it in turns to pick a square card. When you turn over a square, see if you can make the right sound for the letter. 6. If the letter you picked is on your grid you can keep it to cover up the letter on your grid. If you don’t have the letter on your grid, place it back face-down. 7. The winner is the first person to cover all the letters on their card and gets to shout ‘bingo!’. You can of course make different versions of this game to work on numbers, colours and words. This is a great idea and something we used when our daughter first started school. This has so many uses! What fun! Definitely making this to help develop The Boy’s awareness of letters. This is a additional idea which I use when we play “Bingo”, add the letters of the child’s name (all on same line). So, when you call out the letters and they find them they are learning how to spell it at the same time. Gets a bit tricky if name is longer than 8 letters though. (I use 3 rows of 8 squares. Great idea Pauline, thank you.